(CNN) -- When Santiago Martinez wants to give his friends birthday presents, he buys a cake or flowers or sometimes a teddy bear. 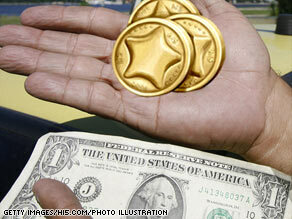 'Virtual currencies,' like the hi5 Coin, shown here, are becoming more important on the Internet. But the 41-year-old, who lives on Mexico's Yucatan Peninsula, doesn't spend pesos or dollars. He buys the gifts with an online-only currency called hi5 Coins. He also doesn't deliver the gifts in the physical world. They appear digitally on his friends' online profiles on a site called hi5, which is a social network like Facebook or MySpace. "They can't eat the cake. It is an image -- the thing that it represents," said Martinez, an accountant with a wife and two kids. "You can send the feeling of that [cake] that you want to send." In any given month, he spends the equivalent of $40 in this manner. But Martinez is hardly alone. As our identities migrate further onto the Internet, currencies that exist only online are becoming a more significant part of commerce on the Web and in the real world. Some, like the hi5 Coin, operate almost like tokens in an arcade or tickets at a fair: They're a stand-in for real-world currency. Other "virtual currencies," like Second Life's Linden Dollars, however, are traded on markets. The currencies also fuel online gaming communities and are becoming an important part of social networks. Several online currencies are competing to be the economic engines for MySpace and Facebook, which don't have their own unified currencies. Other social networking sites, like hi5 and myYearbook, have created their own units of money for their users to spend. All of this movement leads some experts to see a future in which virtual currencies enter the same trading space as their real-world counterparts. The online monies are not robust enough to trade competitively against real-world currencies, but people underestimate the large amount of cash that is transferred from the real world into virtual currencies, said Edward Castronova, a professor of telecommunications at Indiana University. Castronova says people transfer at least $1 billion into the virtual currencies each year, with most of that money going into online games. The actual amount is could much higher, he said, but the market is hard to quantify. "The question is really one of scale," he said. "Is this big enough for someone to take their 401(k) [out of real-world currency] and start looking into this? No, absolutely not." Sometimes, people collect online money simply by purchasing it. In "World of Warcraft," players earn WoW Gold as they advance through the game. The currency has become so sought-after that it is bought and sold on a black market, experts said. Low-wage workers in China are known to play the game for a living and then sell the virtual currency they earn to avid "World of Warcraft" players in the West. This despite the fact that the game's maker prohibits such activities. As the market for online-only currency grows, problems that plague real-world economies start leaking in, said Charles Hudson, who runs the Virtual Goods Summit, an annual conference. "Once you get a virtual economy that's functioning, you run into all the problems that we have with the real economy: taxation, interest rates, inflation. All of the same problems that cause headaches for the Federal Reserve come up in the virtual economy -- and the stakes are the same," he said. The solution has been for each social network or game that uses its own currency to appoint a money manager. Hi5, for instance, employs a staff economist for this purpose. The site soon hopes to make as much money through its virtual currency exchange as it does from advertising, which is the primary revenue source for many social networks. Mark Methenitis, a Dallas attorney who writes a blog called "Law of the Game," said online currencies are "completely unregulated," which will make trading them against each other dangerous. "There is huge potential for fraud, for what would be the equivalent of insider trading," he said. "Also, since these economies are completely under the control of the virtual world owner, it's pretty easy to cause massive hyperinflation." Social networks and virtual worlds are currently trying to find ways to manage or capitalize on their developing economies. These networks' successes may hinge on how they are able to manage their economies and currencies may, experts said. Facebook is researching the idea of creating a unified currency but is "very early" in the process and has not committed to it, the site said in a statement to CNN. Currently, applications on the site -- which allow users to play games with each other and trade gifts -- are powered by currencies made by the application's developers, not by Facebook. These developers are making good money on the system, and Facebook is missing out on profits in that area, said Hudson, of the Virtual Goods Summit. Joey Seiler, who writes about virtual worlds, said virtual goods are becoming more popular because people are taking their online identities more seriously. At first, it may seem ridiculous that someone would pay for virtual currency in order to buy a T-shirt icon to put on a social-network profile. But Seiler said more or his friends see the virtual T-shirts on his Facebook page than see any T-shirt he wears in real life. So being able to spice up his online identity has real value, he said.